Kamberg Valley Hideaway is located in a uniquely scenic and tranquil part of the Drakensberg Mountains. It is the perfect place to get away and relax, or explore the many nature reserves in the area. We accommodate a maximum of 14 guests in three cottages and all cottages have separate and private mountain views. There are several fabulous hiking areas within a short drive. 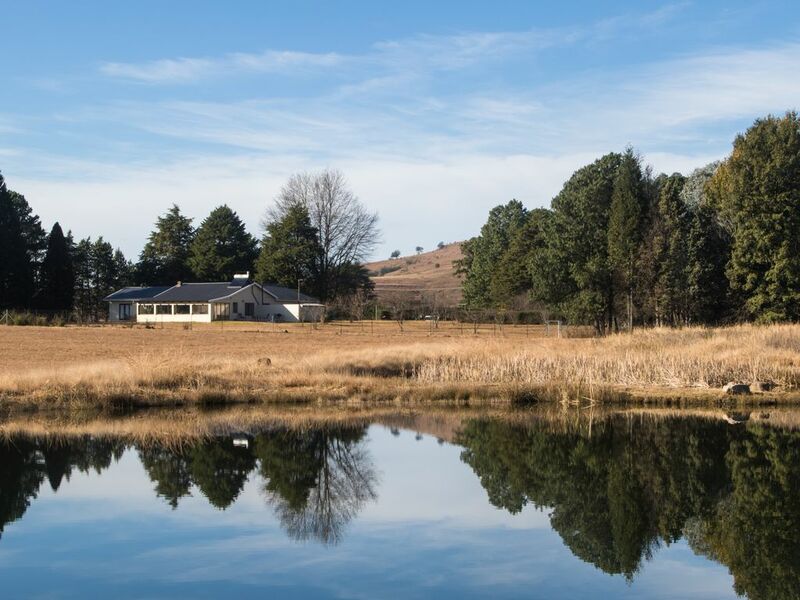 If you are looking for a peaceful holiday surrounded by nature in luxury, self-catering cottages, then Kamberg Valley Hideaway would suit you down to the ground! Mountain View Cottage is a one-bedroom cottage. The bedroom is very spacious and contains either a King Bed or two single beds, plus electric blankets are provided for those cooler winter nights. We can also add a third single bed to the bedroom for a child. The bathroom has a large, separate shower and well lit mirror and all linen and towels are provided. The kitchen is fully equipped and is open plan with the living area, which contains a log fire. Double doors open on to a private patio / braai (BBQ) area which has spectacular views of the mountains. Mountian View Cottage adjoins the main house, however there is a private entrance and private outside area so you will not be disturbed. Kamberg Valley Hideaway itself is a 27 hectare smallholding, and there are some gentle walks on the property that you can enjoy. There is also a fishing dam which is currently stocked with trout and bass, so if you fancy trying your luck, you are welcome to fish in the dam. In addition, one of the owners is a professsional photographer, so if you are keen, you can also arrange some photography workshops during your stay. Close by there are three well know nature reserves, which are all part of the Drakensberg Mountains World Heritage site. Highmoor Nature Reserve is 9kms away and has well stocked trout dams, as well as some beautiful, leisurely walks. Kamberg Nature Reserve is 11kms away and has, arguably the best Bushman's Rock Art Paintings in South Africa. Guests are able to book a guided walk to see these well preserved paintings. Giants Castle is 31kms away and this area is well know for its great hikes and walks, as well as it's Vulture Restaurant which is great for birders and photographers. You do need to book the Vulture Restaurant in advance. There are three restaurants within 2kms of Kamberg Valley Hideaway, which will need to be booked by the morning of the evening you wish to dine there. There are no shops in Kamberg Valley other than a small store where eggs, milk, bread and items such as charcoal and wood may be purchased. The nearest shops and supermarket are located in Nottingham Road, which is 35kms away. My name is Michelle and I am a photographer and qualified KZN Nature Guide, as is my partner Bryan. We moved from the coastal town of St Lucia to this stunning area of the Drakensberg in April 2016 and love it! We used to visit this area for our holidays then late last year we found the most beautiful smallholding to purchase. With Bryan being is a keen fly-fisherman and myself, a photographer, there are so many places we can visit to enjoy our passions. We wake up to the most incredible view every morning and thrive on the peace and tranquility of this unspoilt area. We have the space to offer self-catering accommodation to guests and really love to share the beauty of this part of the Drakensberg. Kamberg Valley Hideaway is geared up for those travellers who are looking to get away from the larger accommodation establishments and really enjoy a relaxing and peaceful break away. We have accommodation for a small number of guests and all our guests are free to explore our property and river walk as well as the surrounding area. The cottages and tastefully decorated, are spacious and you have a lot of privacy. Having been involved in guests visiting South Africa, both Bryan and I have experience in the province and are happy to help out with advise on places to visit, if guests would like. As mentioned, our property caters for a small number of guests in comfortable, spacious and tranquil accommodation. In addition, I offer photography classes, so if anyone in the group would like to book a photography course or workshop, this can also be arranged. The area has a wealth of subject matter for the keen photographer. Our bathroom contains a large, separate shower and has a well lit mirror. Towels are provided. We are located in the foothills of the Drakensberg Mountains and all cottages have a mountain view from their living areas and private patios. Much of the surrounding area is either farmland or the foothills of the Drakensberg Mountains, so it is a very peaceful area with many different hiking trails available within a short drive. The kitchen is open plan and is fully equipped. We please ask that you do not smoke inside the cottage, but outside on the property is fine. We have a stunning River Walk on the property which has plenty of quiet, private spots where you can relax and enjoy the sound of the flowing river. Ideal for those looking to escape to the country and be surrounded by nature. There are many wonderful walks in the Drakensberg Mountains at the end of our road and fly-fishing is available in our dam or those dams in the nearby Nature Reserves. Lovely tranquil setting with wonderful owners. Michelle is a fabulous host, giving us helpful tips on what to see and do. Her personalized photography classes were amazing and so reasonably priced. Hiking in Highmoor is the best in the southern Drakensberg The view from the house is stunning and the air full of birdsong. The house itself is both stylish and comfortable. The bedroom is huge, the kitchen well-equipped kitchen and very modern bathroom. We planned to stay two nights and stayed for six. Thank you so much for you wonderful comments. It was an absolute pleasure to meet you both and have you stay at Kamberg Valley Hideaway. We are so pleased you explored the area and that you enjoyed the hikes at Highmoor Nature Reserve. We also believe they are wonderful hikes. I am looking forward to seeing some of your photographs from Kruger National Park after the Photography classes, so do please send me some once you have had a chance to edit them. Enjoy the rest of your holiday in South Africa and we would be delighted to welcome you back to Kamberg Valley Hideaway if you are ever exploring this part of the World again. If you enjoy walking / hiking, fishing, birding and photography there are plenty of scenic areas for you to visit to enjoy these activities. There are also several Mountain Bike Trails, so guests are welcome to bring their bikes with them to enjoy these trails. The nearest supermarket and shops are 35kms away, so we do recommend that guests purchase all supplies before arriving at Kamberg Valley Hideaway.